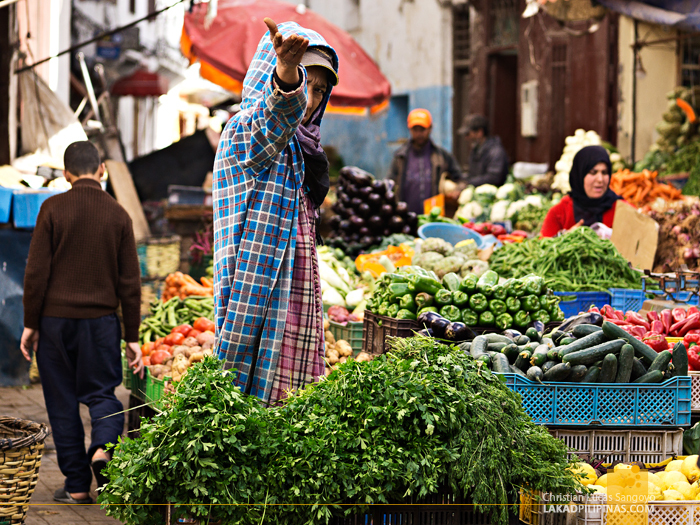 MOROCCO | Casablanca in Four Days ~ Are You Scared Yet? It was totally unexpected that we’d be scared of Casablanca. Isn’t it supposed to be all glorious beaches and syrupy romance? 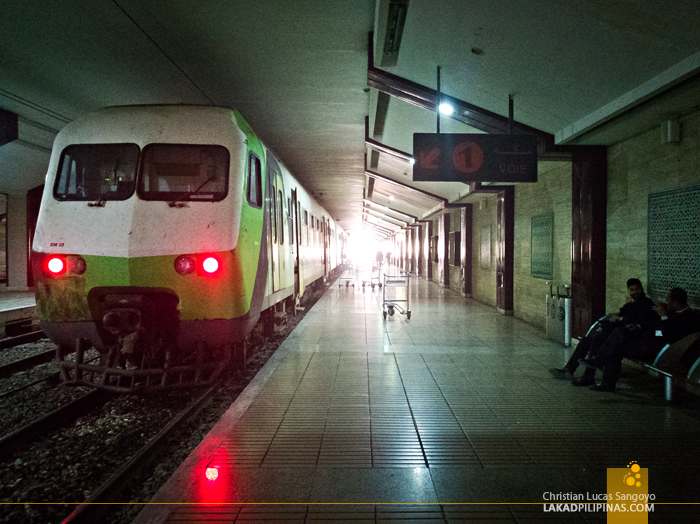 But that’s what we felt the moment we came out of the train that brought us from the airport to the Casa Port station. Without saying a word to C, she also sensed it. The guide books and blogs don’t mention it, but there’s something about this city that makes you keep your phone in your pocket and your cameras zipped tight inside your bag. 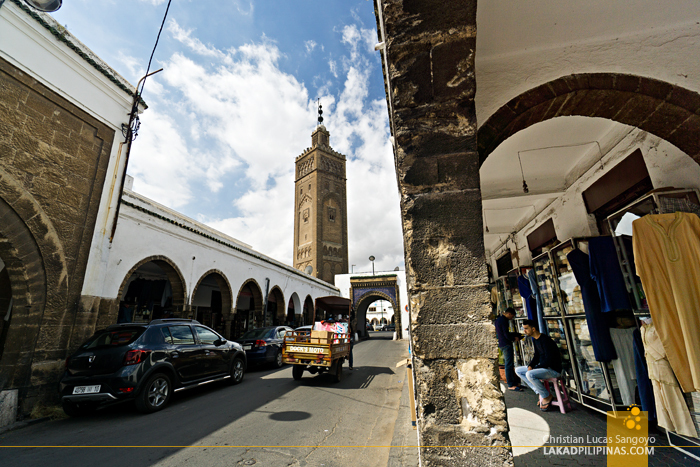 We arrived at Morocco’s largest and one of its oldest cities after a grueling twenty three-hour flight from Singapore to Casablanca via Jeddah. Tired but elated that we’re finally in Morocco, we stepped out of the plane and got the shock of our lives. It’s cold. Like sixteen degrees cold. Like total ignoramuses, we expected Africa to be hot, especially during the summer months. The summer months in South East Asia, that is. We’re in Northern Africa, dufus, and we didn’t have a single winter clothes with us. 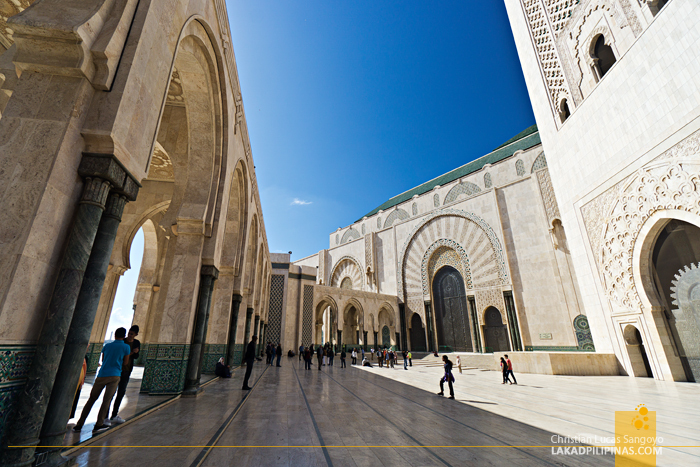 Most travelers recommend staying for only a single day in Casablanca. 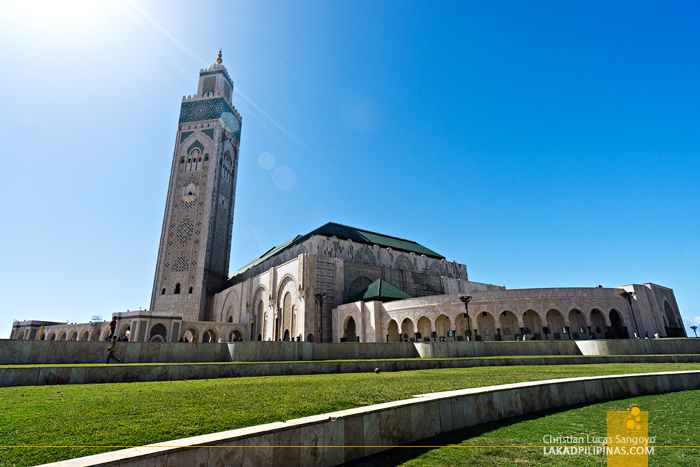 Their itinerary consisting only of a quick trip to the medina, a visit to the Hassan II Mosque, and then back to the train station to continue their journey to the next destination. 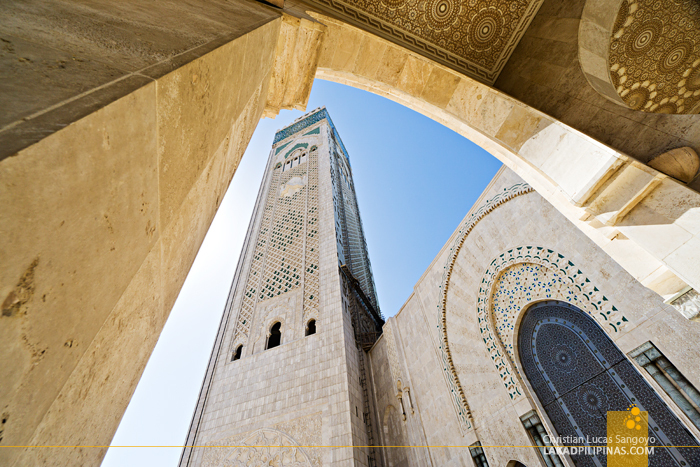 I do, however, recommend staying at least overnight in Casablanca. That way, you get to see more of the city, and you can even add a visit to its famous beaches. Our Casablanca itinerary extended to four days due to the fact that we’re extremely tired upon arrival that we slept off our first whole day. 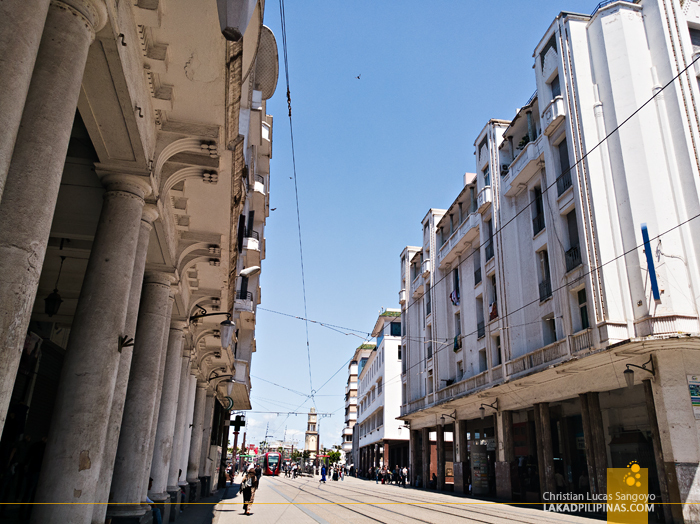 The second day, we explored the Old and the New Medina. On the third, we spent the whole day on the beach. 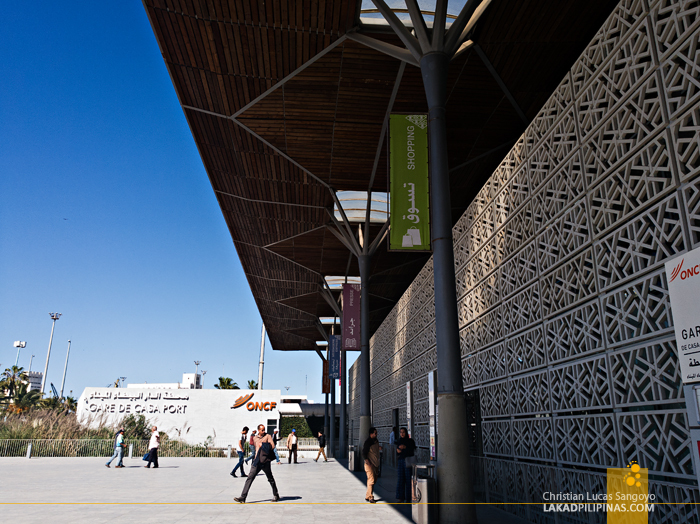 And on our fourth day, we departed for Rabat. 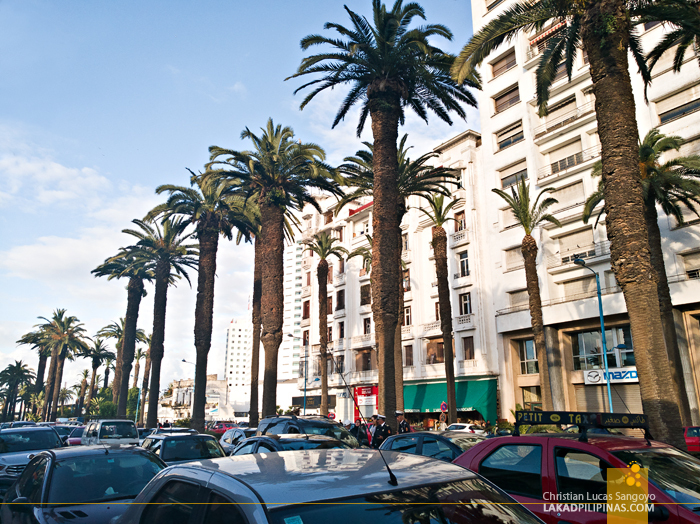 Getting from Casablanca’s Muhammed V International Airport to the Casablanca city center is easy and cheap. We took the train to Casa Port Station (there’s another station called Casa Voyageurs, don’t alight there unless that’s where your lodging is, or you’re transferring to another city), which took about an hour and a half for MAD 43.00 (USD 4.50) per person. The train is clean, fast, and comfortable. 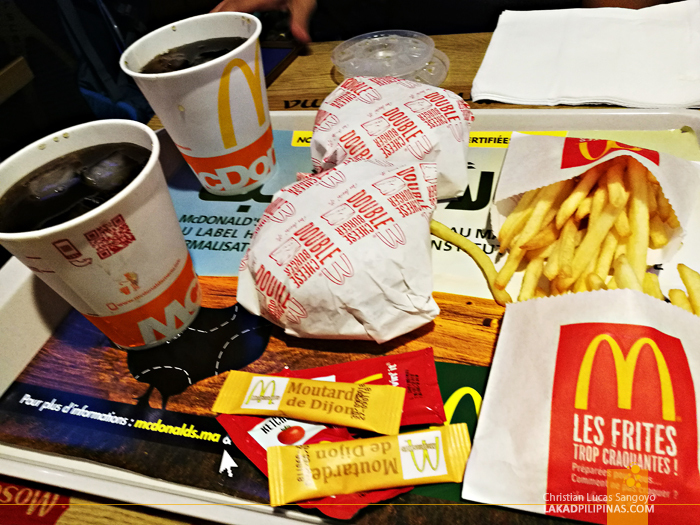 We celebrated a bit upon arrival at the airy and modern hall of Casa Port, munching on—forgive us—McDonald’s burgers and fries lathered in Dijon mustard (check out our Casablanca food trip). All our weariness forgotten, we now had the energy to load a local sim card to get connected for our month-long Moroccan adventure—the second half of our SEA2africa two-month summer trip. We chose Maroc Telecom, for they seemed to have the best deal at the time, MAD 50.00 (USD 5.25) for 5GB of data valid for one month. It was enough for the whole duration of our trip, we didn’t top up at all. 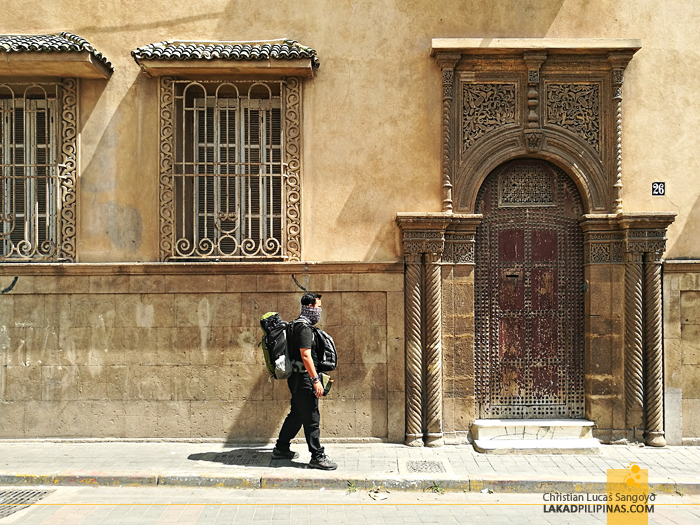 With our phones Internet-ready, we fired up Google Maps and followed its direction to our lodging in Casablanca, the Youth Hostel, which is inside the maze of its medina. Walking along the streets of Casa, we can’t help but notice the bystanders along the streets, guys doing nothing but looking at the passing crowd. This started the tightening knot in our stomach. It was midafternoon when we arrived at the doors of the hostel. Extremely tired, we decided to do absolutely nothing on our first day in Casablanca but sleep. So sleep we did. We were up early the next day. 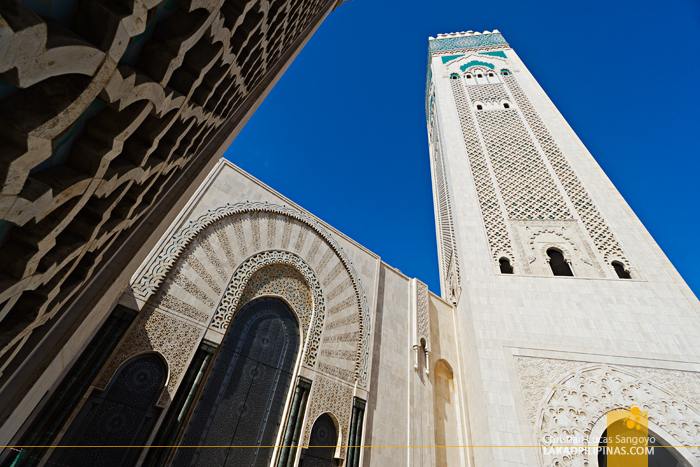 With new vitality, we were set to explore Casablanca. 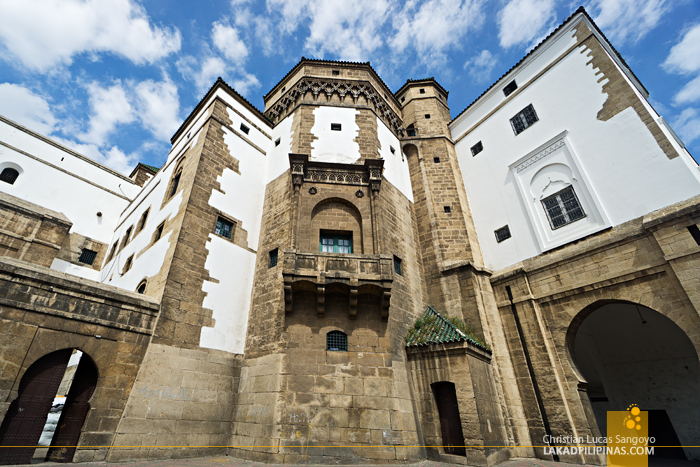 We set our sights to the farthest walkable tourist attraction on our list, the Royal Palace and the Mahkama du Pacha—an ornate judiciary house we read about online. They’re about three kilometers away from where we’re staying, and it took us more than an hour to reach it. 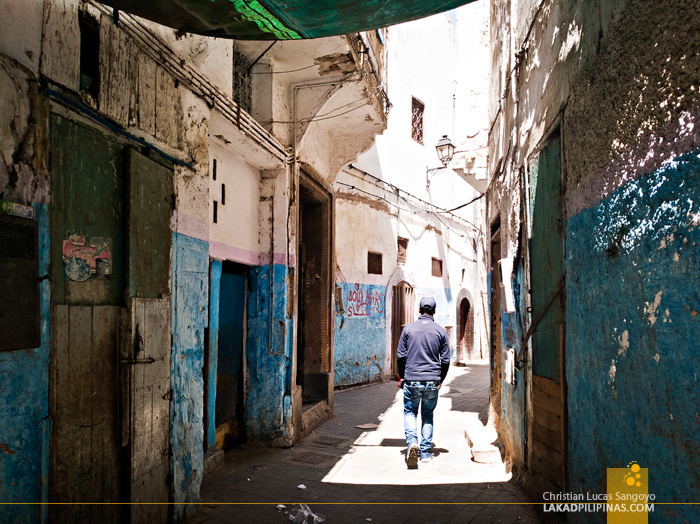 In the process of going there, we got to have a look-see of Casablanca’s city life. And boy, did it intimidate us. Not a few guys approached us, asking for a few dirhams or cigarettes, and they don’t appear too friendly either. Like the previous day, we felt it dangerous to be wagging our phones around and wearing our cameras on our necks. I don’t know if it’s just us, since we’re new to Morocco and were still adjusting, but our gut was telling us to be real careful. 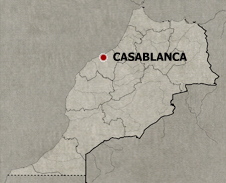 No other place has sent our spider senses tingling more than Casablanca. 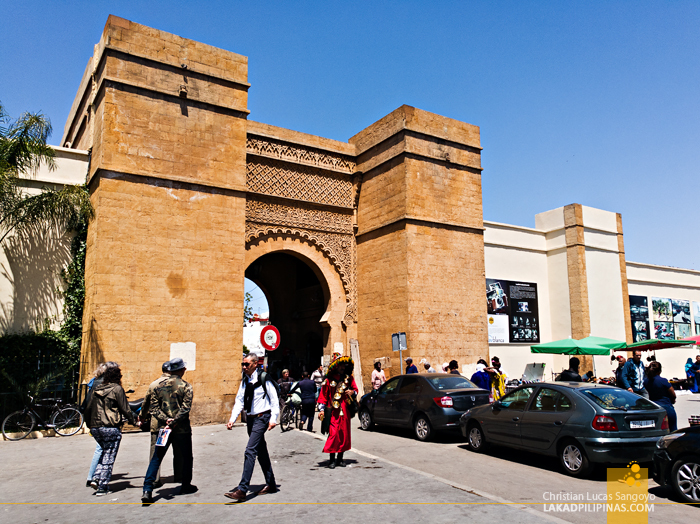 In all fairness, we arrived at the gates of Casablanca’s Royal Palace without incident. The only problem was, tourists aren’t allowed inside. We took a photo of the gate (with permission from the guard), which really isn’t that impressive, then walked a few more meters to the Mahkama Du Pacha. We were about to enter when we were stopped by another guard. Tourists are also not allowed inside unless you’re on a guided tour. It is a functioning government building up to this time. Darn. What to do? We walked around the building and found the area to be a lively market of sorts. 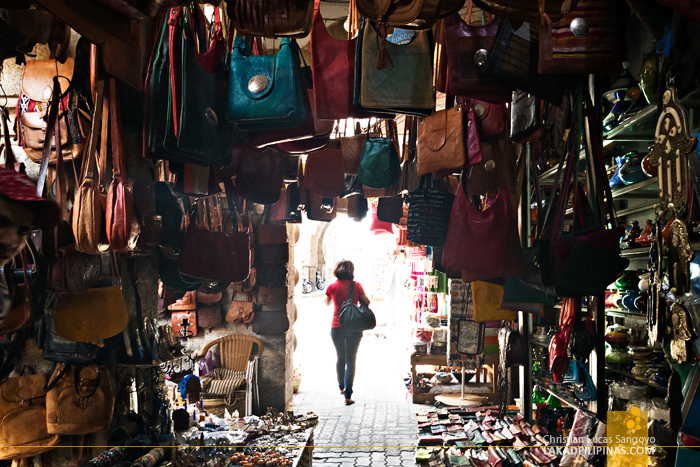 Quartier Des Habous, the city’s New Medina or walled town. 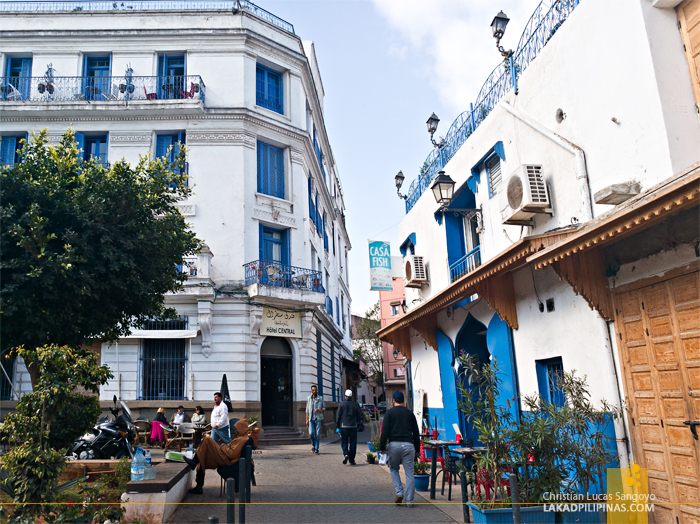 Built by the French during the 1930s, it was our first real look at Morocco. And it looked like our very own Divisoria, but with a heavy dose of culture, complete with mosques with towering angular minarets. It was beautifully chaotic, quite exciting! Shops were selling all sorts of uniquely Moroccan items—leather bags, metal lamps, ceramics, jewelries, handicrafts, colorful clothing—and most of these, handmade. Disoriented, we somehow found our way to a local market where we found lunch. Little did we know that the adjacent Butcher’s Market was one of the Roadblocks for the tenth season of our favorite show, The Amazing Race. We munched on our chawarma, totally oblivious to that fact. 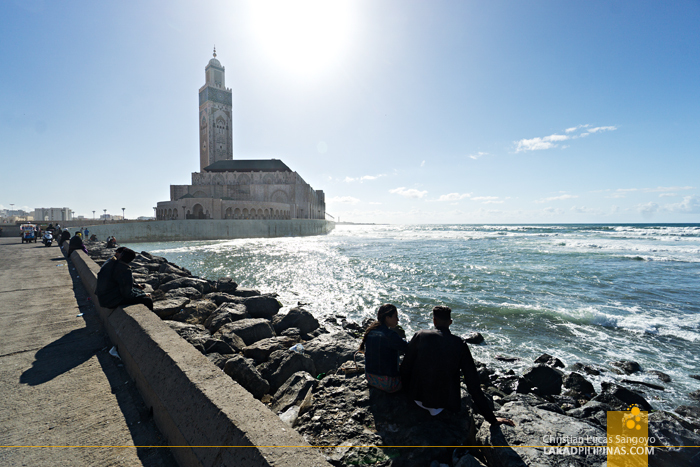 Walking back on a different route, we wended our way to the Casablanca Medina, then pushed on to the biggest mosque in the whole of Africa, the Hassan II Mosque. Located on a promontory overlooking the Atlantic Ocean, it is Casa’s pride and joy. From the plaza fronting it, we can already see how massive this structure is, point in fact, it is the fifth largest of its kind in the world, and its soaring minaret bags the title of being tallest religious structure on Earth. We felt like ants as we walked along the perimeter of the mosque. Being non-Muslims, we weren’t allowed to see its hallowed halls though. Still, it was a marvel to see this mosque first-hand. Even from the outside, we can see how intricate its decors are, from the hand-carvings along the walls, the massive doors, and the colorful mosaics—lots and lots of mosaics. It is without a UNESCO stamp, but still, this is, hands down, one of the most beautiful structures I’ve ever laid eyes upon. 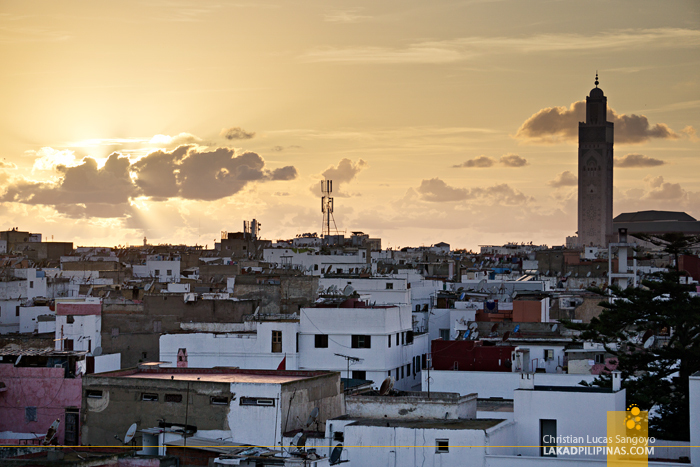 If there’s only one place you should see in Casablanca, this is it. On the mosque’s right side is a boulevard facing the ocean. We thought of trying a different route back to the medina, and decided to take the longer way back just to see where it ends. 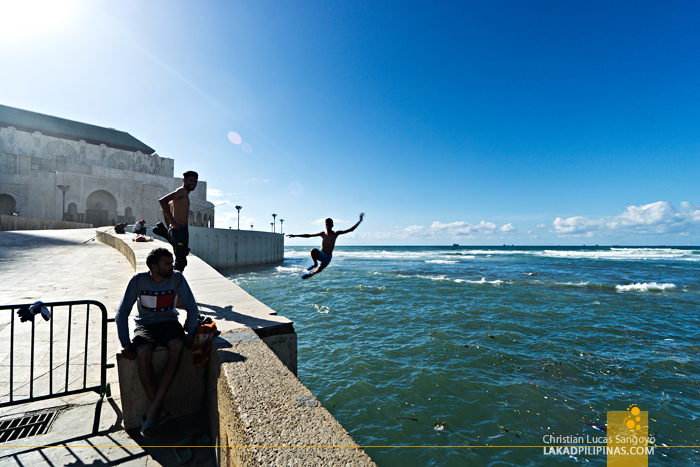 The breakwater was alive with kids running and jumping towards the waters—unmindful of the obvious flotsam and the cold, streetfood vendors hawking homemade potato crisps at ten dirhams per bag (USD 1.00) , and couples and friends hanging out on the ledge. It actually reminds me of our very own Manila Bay Breakwater. The crowd got thinner as we went further until we were the only people left. We turned to Casa’s new CBD, which looked like a ghost town as well, before turning right towards the medina’s bab or gate. 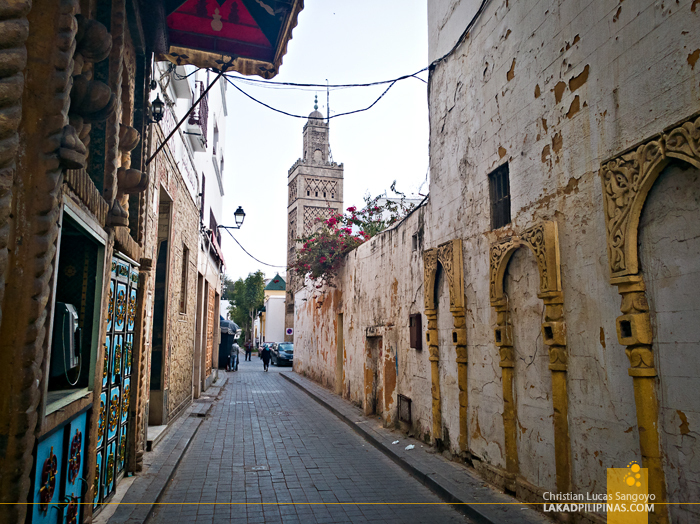 It seems like every town in Morocco has its own medina—a small section of the city that is surrounded by a high wall and can be accessed through massive bab openings along the perimeter. The pathways inside these places are very narrow, most of the times just a meter wide, making it impossible for cars to drive inside. 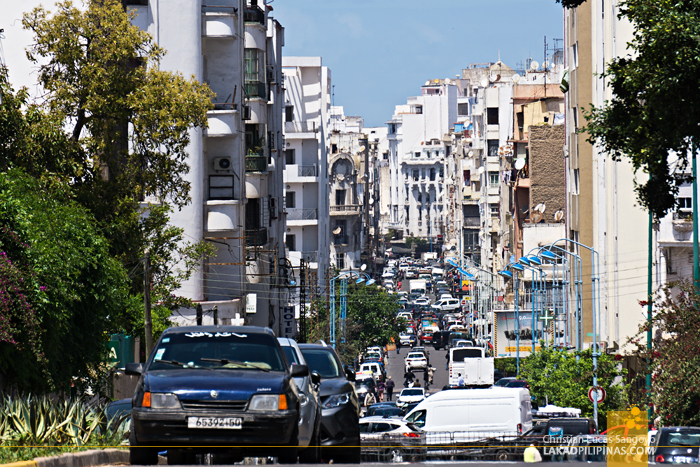 The one in Casablanca is exactly like that, although there are some areas where it’s wide enough for motorized traffic to come in. 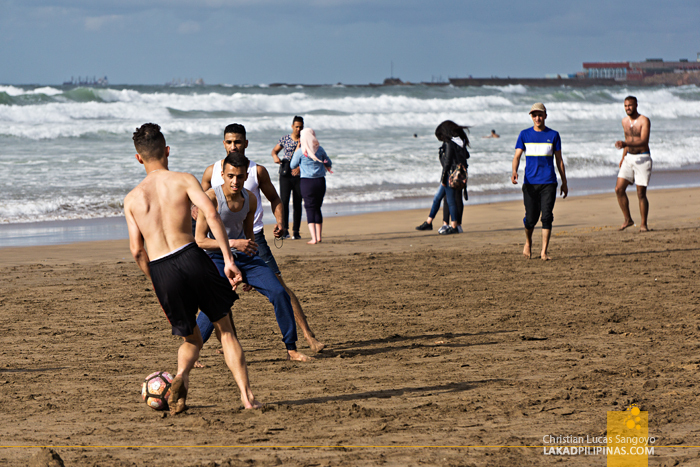 But unlike other medinas around Morocco, which are considered tourist spots—some even being designated as World Heritage Sites like those in Fes, Marrakech, Tetouan, and Essaouira—the Casablanca medina isn’t really pinned on the tourist map. Well, it is interesting enough if it’s your first visit to Morocco, but compared to the complexity and grandness of its counterparts, it is considered petite and not really that unique. Still, we went around and tried to see each and every inch of the medina. An impossible task since even the most basic one can be really confusing. 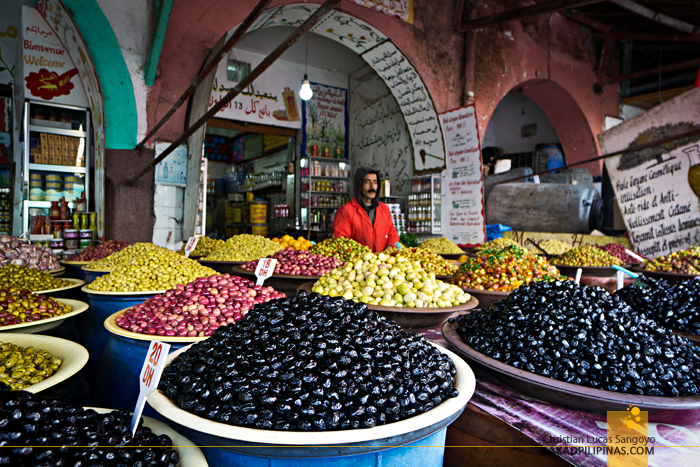 Going in circles, we found its market area to be very similar to ordinary markets in South East Asia. To be honest, the real reason why we tirelessly explored it was the need to buy jackets. We tried for a few days if we can weather the cold, but it was soon obvious that we cannot. 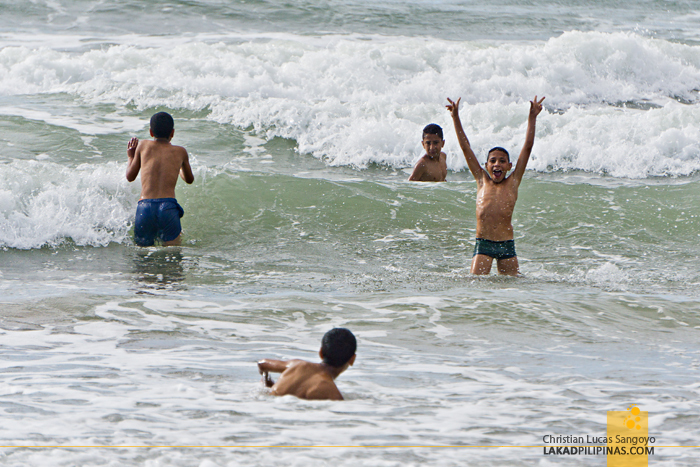 Plage Ain Diab was our destination for our third day in Casablanca. 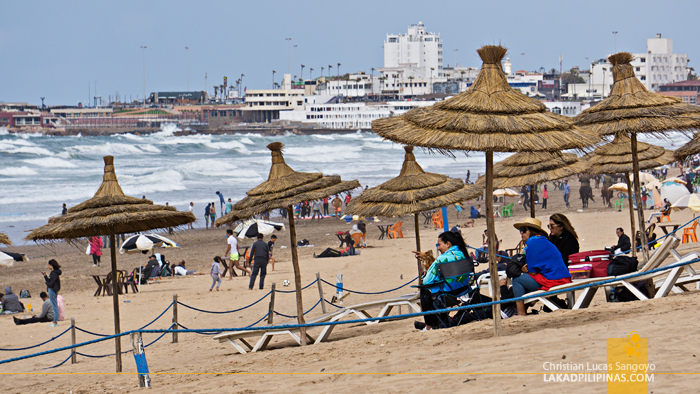 We dedicated a whole day to see this beach, since we needed to ride the Casablanca tramway to reach it. It was quite a ways away from the city. The nearest tram to the medina was located at the United Nations Square, and the ride took about an hour for MAD 14.00 (USD 1.40) per person. Once there, the sun hid behind a thick blanket of clouds and left us with a very gray day at the beach. Darn it. 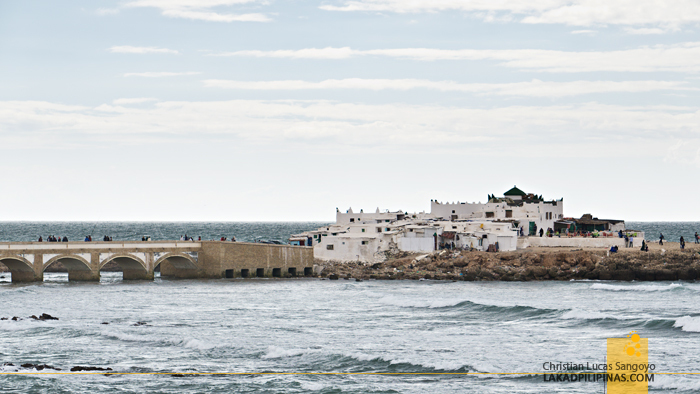 From a KFC joint where we had lunch, we combed the beach eastward towards the Mausolee Sidi Abderrahmane, an islet near the shore accessible by a bridge or by walking along the waters during low tide. It was whipping cold but that didn’t deter the locals from swimming on the ocean, we can even see a few surfers riding the waves. On shore, Moroccans were offering rides on horses and camels—which we had to say no to every time we pass one. The sand was course and brown, not really the romantic Casablanca beach I was picturing. En route to the islet, we had to dodge an unlimited numbers of impromptu football matches being played along the beach. These guys are football addicts, they’d kick anything that rolls on the ground. Two kilometers seemed like an eternity with all the footballs we’ve had to dodge but we eventually reached the bridge, crossed it, and saw… nothing extraordinary. The Mausoleum of Marabout Sidi Abderrahman is actually the burial ground of Algiers founder Sidi Abderrhamane Thaalibi who is considered a saint by most Moroccans. Like most holy places in Morocco, non-muslims aren’t allowed to enter the mausoleum, so we only stayed around for a few minutes before walking back to KFC. I asked C if she wanted to see the chic cafes at the La Corniche, which was another kilometer away from the chicken house—the look she gave me said no. Alrighty then, were done with Casablanca, back to the medina! 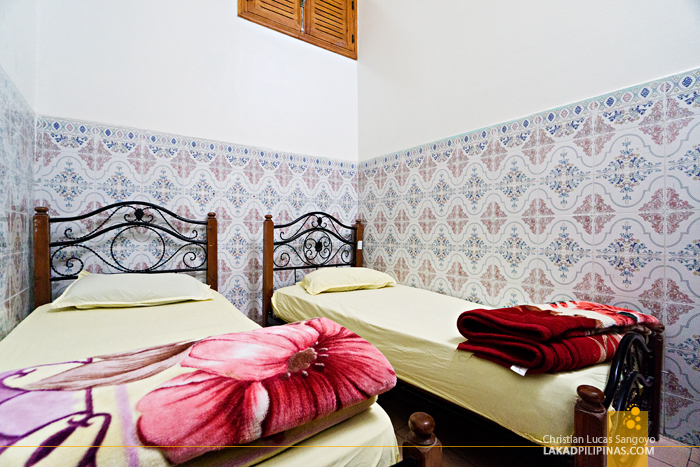 Cost was the primary driving force in choosing our accommodations in Morocco. 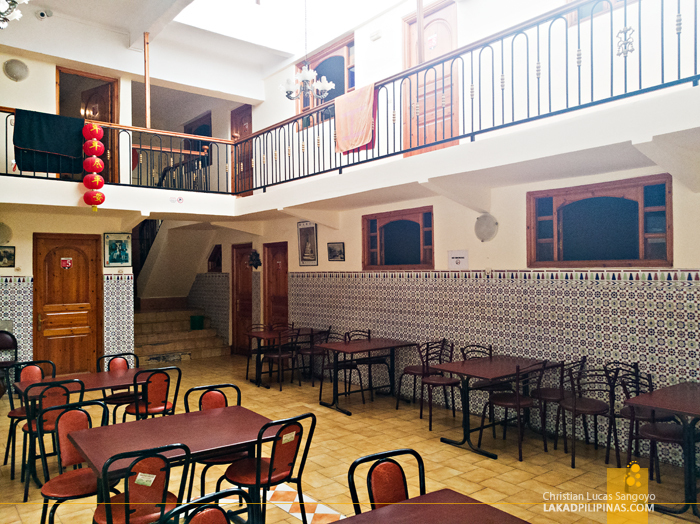 Youth Hostel was the cheapest one we found in Casablanca that has a good location—right smack in the middle of the medina. There’s nothing fancy about this hostel, but they do have private rooms. These are small and very basic rooms with nothing on them but a bed and a closet. It does have an electrical outlet where you can charge your phone and the wi-fi signal is pretty reliable. There’s no en suite toilet, and we’d have to drag our cold and wet selves across the hallway every time we took a bath, which was only once since they don’t have a water heater. 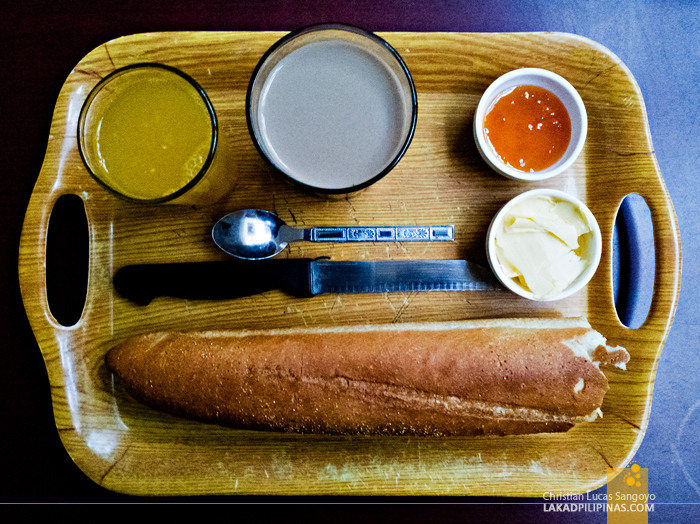 I do like that they have free breakfast, however bare it is—half a French bread, butter, jam, a cup of coffee, and a glass of fresh orange juice. We usually pair the bread with leftover Laughing Cow cheese cubes we procured from YOTEL Singapore, which complements it well. Wanting a bit something more Moroccan, we decided to splurge a bit on our last night in Casablanca and stayed at Hotel Central. It was about fifteen steps from the doors of Youth Hostel. 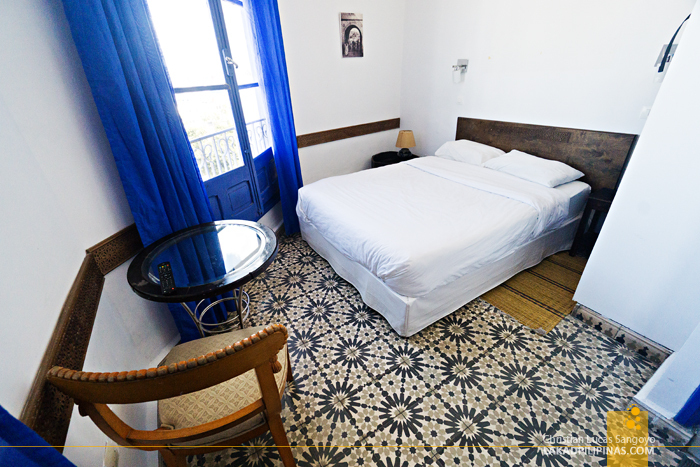 It is expensive—by our standards—but we were on the fifth floor, have a balcony that overlooks the medina, an en suite toilet and bath with hot shower (where we can even wash our clothes), and a rooftop where beer is served (expensive though). 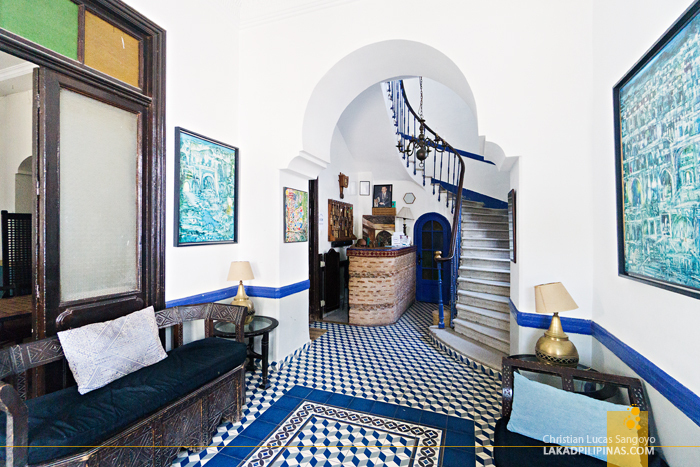 The hotel has a very Moroccan feel, from its white walls and wooden windows, to its unending stairwell and distinctive Moroccan tiles. The only downside on staying here is that breakfast isn’t complimentary and there’s no elevator. Good thing we don’t have luggage with us, but still, our backpacks felt like a ton after climbing that much flights of stairs.